When choosing a roofing material, preference should be given to lightweight coatings that do not require reinforcement of the supporting frame. 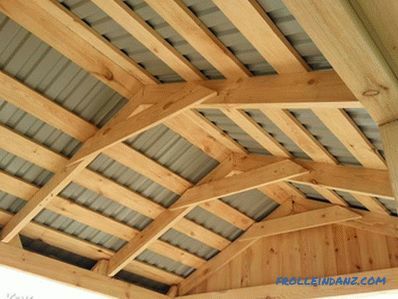 It is extremely important to choose the optimal angle of slope of the roof structure. 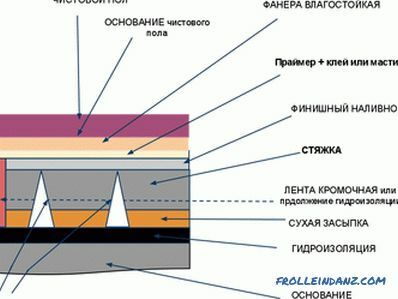 With a large value of this parameter, it will be necessary to provide special elements of protection against wind, while for a flat roof you will probably have to strengthen its frame. It is desirable to treat the roofing with special water-repellent compositions or use waterproof materials for its manufacture. Both the contours of the roof and the material used to cover it must organically "fit" into the decorative atmosphere created by the buildings located next door. 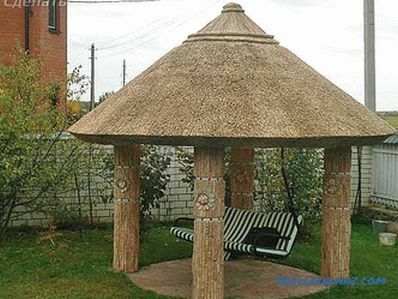 This means that the gazebo and its roof should not be in sharp contrast to the style of execution with other buildings. 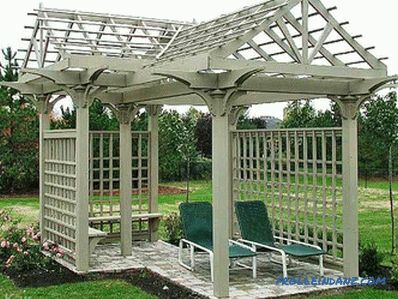 In the event that the suburban plot is conceived and planned in a certain landscape style, then the gazebo together with the roof should correspond this planning idea. 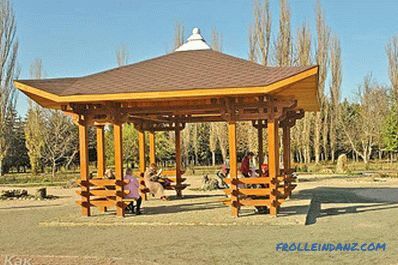 The most simple (in terms of the preparation of the rafter system) are single and double gable roof structures used for gazebos square shape. A little more difficult will be the so-called hip roofs with four slopes, two of which are made in the form of trapezium, and the other two have a triangular shape. They are used in arbors of a multifaceted form. Of particular interest are dome-shaped or tent structures, which have four triangular slopes, which are a good protection from wind and precipitation. 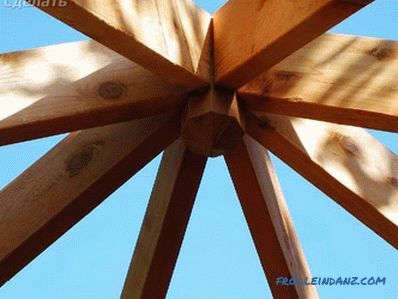 Such roofs do not have a ridge, the function of which is performed by a ridge knot located at the point of convergence of triangular ramps. 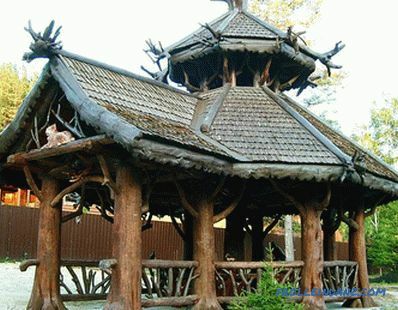 Traditional roofing materials are used as protective coatings for gazebos. Their choice is determined not only by the type of roof, but also by the economic feasibility of this material. 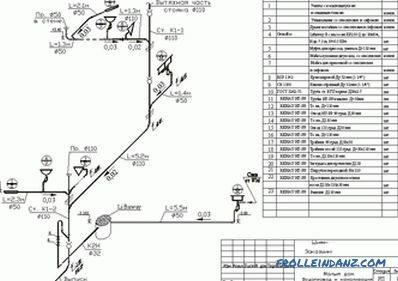 So, sheet material will be more reasonable to use on pitched structures, while for arranging hip, hip and multifaceted roofs such material is unlikely, since there is a lot of waste when working with it. Often, shingles (small wooden planks) are used as roofing. 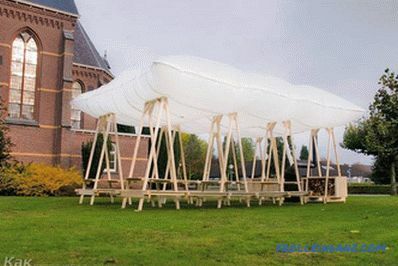 It should be noted that the roof recruited from such boards looks great on tent structures made in the Oriental style. It will look good on the roof of the gazebo and standard metal tile. But in the case of her choice, we should not forget about the significant losses in laying the material, as well as the strong noise effect of metal surfaces, which manifests itself during the rain. 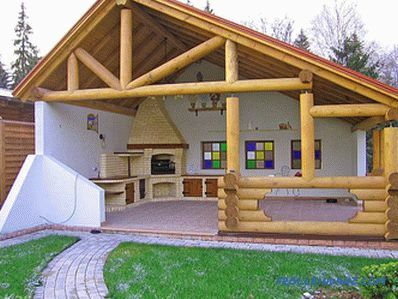 It looks quite attractive on a light construction and the covering is made of soft shingles. Roofing material of this class easily fits on any of the constructions we have considered earlier. When installing it, you can not worry about the excess waste and the need to prepare a powerful truss system. The only condition for its use - is the use of a continuous crates. First of all, subrafter bars, previously treated with an antiseptic, should be placed on the pole supports (they can also be grinded and then closed with tar). 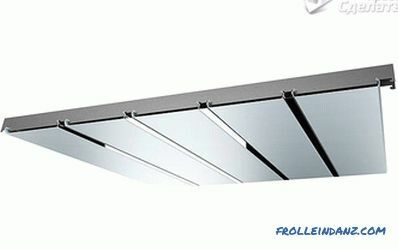 Note that the horizontal position of their installation must be controlled by the construction level. After that, hanging rafters of planks are mounted on the ground, which are then installed in place as assembled. The lathing for the roof is made of planks or plywood, which are fixed directly to the rafters with nails.Under the soft roof (flexible shingles), a continuous crate is used, while for metal tiles and natural roofs, a batten made of 50x50 mm bars located on a slope with a pitch of 25-30 cm is best. Remember to put a layer of waterproofing, and only after that proceed to the laying of a protective coating. Now your home plot looks even better. In the new arbor, you can gather friends or relax in the family circle. Next, build an alpine slide or a small pond with a fountain. alpine slide in the country. 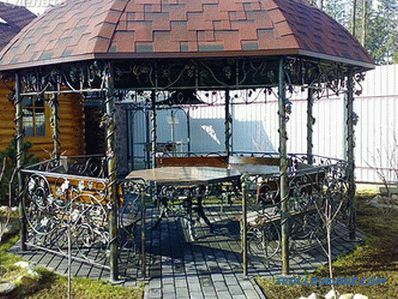 Watch a video about choosing a gazebo design and bringing an idea to life. 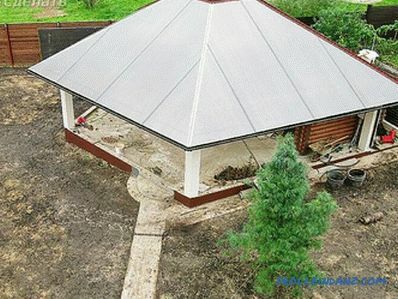 We offer to look at different solutions for decorating the roof on the garden pavilions. 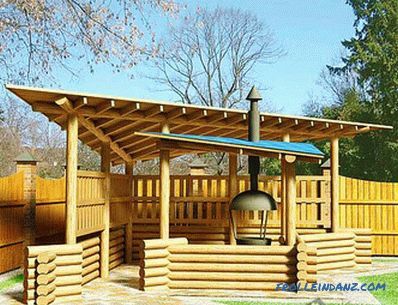 If you have ideas on how to build a roof on the gazebo, leave your comments on the article.